TL; DR: “High quality or low cost?” It’s a question many consider when purchasing web hosting. Luckily, London-based WebHost.UK.Net is trying to turn that “or” into an “and.” We recently sat down with Founder Sam Kulkarni, who told us his company guarantees high-performing, cost-efficient services coupled with stellar support. It’s a lot to claim. But, with a seasoned tech support team, more than a decade of direct hosting experience, and all SSD-powered infrastructure, WebHost.UK.Net is succeeding in delivering the quality web solutions modern businesses need at budget-friendly rates. Cheap and reliable are two words that don’t typically go together, especially when you’re talking about web hosting. Usually, if you want cheap hosting, you have to deal with spotty support, missing features, frequent downtime, and slow servers. To get great support, full-featured hosting, and fast, reliable servers, users normally have to shell out the big bucks. 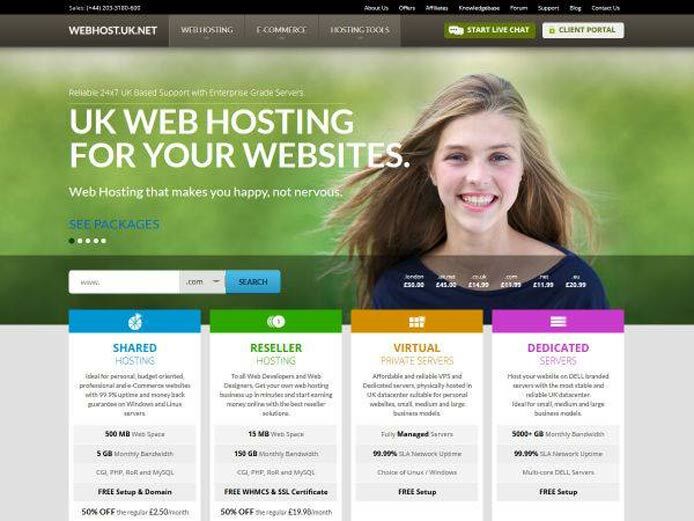 More than a decade ago, Sam Kulkarni, founder of WebHost.UK.Net, sought to change that. Sam, a veteran tech support manager for some of the world’s biggest web hosting companies, wanted to run what he calls “the UK’s best cheap web hosting,” delivering top-notch support and super-fast SSD hosting packages starting at only £1 per month. SSDs — or solid state drives — are a vast improvement over HDDs — or hard disk drives. HDD computer storage uses a moving read/write head and magnetic platters to store and retrieve data. There’s always a time factor in moving physical parts, with SSDs performing up to 20 times faster than HDDs. There’s also the fact that moving parts wear down and fail. SSDs have no moving parts. Instead, they use flash memory to store data, providing better performance and reliability, which is why SSDs are standard in mobile devices like smartphones and tablets, and only bargain bin laptops still use HDDs. To provide higher-performing hosting solutions, many hosting companies have made the move to running customers’ websites on SSDs. And WebHost.UK.Net is the latest to invest in SSD-run servers. All of WebHost.UK.Net’s hosting plans are powered by lightning-fast SSDs. Sam told us WebHost.UK.Net offers a 99.9% uptime guarantee, but also noted that 100% is a more accurate assessment of site availability. This is not only due to the stability of SSDs, but also the cloud infrastructure on which WebHost.UK.Net runs. SSDs are more expensive than HDDs, which is why web hosting companies are slow to adopt them, despite their many advantages to hosting customers. Thankfully, WebHost.UK.Net found a way to justify the investment and still allow site owners with tight budgets to take advantage of the fast, reliable performance SSDs deliver. Described as “best for personal, budget, professional and eCommerce websites,” the £1 per month shared hosting package offers a massive 1GB of SSD web space, unlimited bandwidth, CGI, PHP, Ruby on Rails, and MySQL. It also includes a free SSL certificate at no additional cost, which is also uncommon. All of WebHost.UK.Net’s server packages are available in either Linux or Windows, with cPanel or Plex control panel. The £14.99 per year Linux Standard+ account, which Sam described as “suitable to host one website with a few email accounts to establish your online identity as a person or a business,” includes a free website builder, one-click WebApp install for more than 400 apps and scripts, Attracta SEO tools, and £75 of Google AdWords credit. No matter your mission online, WebHost.UK.Net has a package specifically tailored to your business needs. If you’re looking to launch multiple sites, upgrade to the £29.99 per year Linux Elite+ account, which, in addition to 5GB of space on a lightning fast SSD drive, includes the ability to have up to five websites under the same account, as well as 10 MySQL databases and 25 email accounts. Customers with even greater needs can move up to Linux Business+ with 10GB of web space and an unlimited number of websites, MySQL databases, and email accounts at £49.99 annually. Alternatively, site owners can take advantage of the Linux Pro+ plan for £95.99 per year for all the same unlimited features plus an extra 5GB of web space and free domain name registration or transfer. In addition the Linux- and Windows-powered shared hosting, WebHost.UK.Net offers several specialized hosting options. The most popular option would have to be the company’s managed WordPress hosting offering. “Our ready-to-go WordPress hosting gets you started with your WordPress website in less than a minute,” Sam said. For only £5 per month, you get a pre-installed, ready-to-go-live WordPress website accelerated by a powerful LiteSpeed web server PHP-FPM, and OpCache caching. “We are the most preferred UK WordPress host because we offer such an expansive WordPress feature set,” Sam said. WebHost.UK.Net’s WordPress plans are packed with tools to help optimize customers’ WordPress sites. WebHost.UK.Net’s WordPress packages include instant account setup, WordPress optimized servers, easy WordPress account upgrade, DDoS protection, automated free backups, and a comprehensive WordPress tutorial. Free migration of WordPress sites from other hosting providers is another big selling point for established site owners. Online merchants can take advantage of secured PCI-compliant eCommerce web hosting at very low prices. At £99.99 per year for shared server Linux hosting and £119.99 for Windows, WebHost.UK.Net’s eCommerce plans include 10GB of disk space, 100GB of bandwidth, an unlimited number of websites, a free domain name, and a dedicated IP address. More advanced eCommerce hosting packages are also available in cloud VPS and dedicated server configurations. And all dedicated server plans come with a 100% network uptime guarantee. Web designers and developers or entrepreneurs can also sign up for private-label reseller packages, offering WebHost.UK.Net SSD-powered Linux and Windows servers to their own customers. “Without having to invest in expensive hardware and infrastructure, you can start your own web hosting business by choosing our cheap and affordable UK reseller web hosting plans, and offer web hosting to your customers,” Sam said. WebHost.UK.Net makes it easy to sell its services as your own with 100% private label hosting and even technical support that answers to your brand name. Sam began WebHost.UK.Net with an aim to deliver hands-on support coupled with high-quality hosting services, and the company’s remained true to that mission. “Our goal was to offer quality testing and top-notch support to our customer base, and that hasn’t changed a bit,” Sam said. WebHost.UK.Net offers a 24/7 online priority customer help desk with an incredible guaranteed 30-minute response time on all tickets. Telephone support is available Monday through Friday, 10 am to 6 pm GMT. The company is so sure you’ll love its support and service that it even offers a risk-free, money-back guarantee. If you aren’t completely satisfied within the first 30 days, WebHost.UK.Net will refund your money, no questions asked.